Oops - we don't appear to have a video for the DocuMate 252. It has been a great scanner for me. However, I am now considering a change. There are no Windows 7 drivers for it and although you can use Vista drivers to get the scanning to work, these drivers are known to cause windows 7 to fail to shutdown or even crash (blue screen of death) with a driver error. Xerox are not coming out with Windows 7 drivers for this model so you should consider it end of line. I dont regret having it one bit. Fast, reliable and saw me through the Windows XP and Vista days. However, I would not be buying it now as the lack of Windows 7 drivers will mean a limited life going foward. The Xerox DocuMate 252 has proved to be an excellent choice of machine for the project on which we are working. It is simple to use. Pages are scanned quickly and with a very good quality of image. The ease with which simplex or duplex can be selected and scanned has been particularly useful. excellent products and service – the combination of Scansoft and Document 252 answers our prayers for ease of office scanning and filing – as we work towards a (semi!) paperless office. The products have speeded our compliance and subsequent cashflow processes and eased the pressure on office space and filing cabinets. Could not be more pleased! Have recommended to other IFA’s in our Network. I did quite a lot of research before choosing a scanner to be used in our small office and the Xerox Documate 252 was my chosen device. I required a scanner to begin setting up a paperless office, which would be fast without costing too much. Another important factor was that the scanner came with TWAIN drivers so that it would be compatible with our document management system. The Documate 252 covered all these areas and has impressed me greatly. It is fast, quiet and reliable. The Documate 252 has been fine. No problems to report at the moment. I would give it a mark 4. In a word, brilliant. I'm a financial adviser and I've used various scanners over the years to try to cut down on paper, and this is easily the best I've used (this is number 4). I was already using Paperport, so knowing that it was packaged with this product was a big plus, and the integration is seamless. The scanner I used last was a very fast (and large) office scanner, but resolution was poor, and Paperport integration was slow and cumbersome. The Xerox 252 scans a little slower, but I get the time back when viewing the document afterwards. The simultaneous duplexing feature is superb, much more efficient than rollering the paper backwards and forwards and flipping it over - as other scanners tend to do. Noise wise, it is fine. It is still possible to have a telephone conversation whilst scanning only a couple of feet away. Value for money - can't fault it. If my budget had been a little bigger, I'd have gone for a slightly faster version of the same thing, but I decided not to spend that money and I'm happy with my decision. As for 'Trade Scanners', delivery was prompt - as promised, and queries were dealt with quickly and efficiently. All in all, one happy customer! There's a lot to like about the Visioneer Xerox DocuMate 252 document management scanner - the faster, better, easier-to-use workgroup scanner solution. 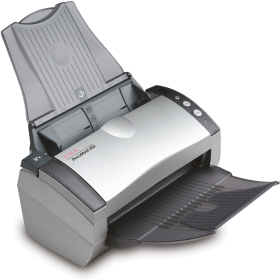 Twice as fast as the leading brand workgroup scanner in duplex mode, The DocuMate 252 is the price and performance leader in its category. It also includes a powerful suite of applications that improve image quality, OCR accuracy and document management. And, its revolutionary one touch scanning and small compact size makes it easy to use on any desktop or in any department. The DocuMate 252 quickly handles many different tasks at hand - right at the desktop. It has a 50-page** automatic document feeder that scans 50 images per minute using dual CCDs - doubling your speed and productivity for two-sided documents. The DocuMate 252's powerful software, robust functionality and hardware specifications deliver the speed and quality you would expect from a more expensive scanner. A searchable PDF feature lets you send, copy, paste, re-use, and highlight text while maintaining the integrity of the original document image. The bundled Kofax VRS software provides such capabilities as autoexposure, autocropping and wide angle de-skew. VRS also helps improve the accuracy of recognition software, thereby reducing the need for manual correction of intelligent character recognition and OCR results. And document size is not an issue for the DocuMate 252. It scans everything from business cards and photos up to legal-size documents, with superior image quality. The DocuMate 252's one touch technology scans from the desktop to nine different customizable applications or devices and documents can be converted to text-searchable PDF in one easy step. Now you can instantly search documents for keywords or phrases. The DocuMate 252's one-step installation is a snap with the plug and play Hi-Speed USB 2.0 port. And it's small footprint, just 6" x 13", makes it ideal for the desktop. The DocuMate 252's one touch technology lets you send documents to one of nine preselected or user-defined destinations eliminating up to 12 steps in the scanning process. Think improved speed, performance, and most important, productivity.